"Guards, clear that away. How can my guests be expected to dance around THAT?" Roger Corman really hit his stride with these two Edgar Allan Poe adaptations. Masque of the Red Death features probably the script closest to the original Poe tale of any in the series, as well as clearly the best production values of them (if not of all Corman's films). The Premature Burial lacks Vincent Price, but makes up for it with a tormented performance by Oscar®-winner Ray Milland. Masque centers on the wicked, Satan-worshipping Prince Prospero (Price). When a nearby village is struck by the dreaded Red Death, a disease that prominently features uncontrollable bleeding from the pores, Prospero gathers his friends into his castle, where his pact with the devil will keep them safe. But in his cruelty he seizes a young woman, Francesca (then-Paul McCartney squeeze Jane Asher) for purposes of corrupting her. But the Red Death may have plans of its own. This picture is a riot of color, with one dazzling display after another; the cinematography by a young Nicolas Roeg is definitely noteworthy as is the production design. While firmly medieval in character, there is also a stylization that lends it a timeless fairy tale air, much in keeping with the Poe original. The screenplay cleverly weaves the story Hop-Frog into the tale of Prospero, giving the picture a less threadbare feel than some of the Poe series. Purists will no doubt be offended by the needless change of the character name to Hop-Toad, but purists shouldn't be watching Corman Poe movies in any event. Price is allowed to be just as evil as he likes here, and he does so with a sadistic glee. Yet at other times his Prospero is surprisingly quiet, taking a smug satisfaction that if anything is even more evil than his ranting cruelties. Hazel Court does a fine job as his demented sister Juliana. Patrick Magee is a vicious courtier who torments Hop-Toad and meets with some poetic justice of his own in the film. The one place where the production really skimps is in the effects; as characters are afflicted by the Red Death, there's a blatant jump cut, as if Corman had no desire to even try to hide the camera trickery. A little more care should have been taken here. In addition, the use of a little girl, dubbed with a woman's voice, as the midget dancer is quite disorienting. The gore effects and a particularly bloody attack by a raven are, however, quite well done. The co-feature, The Premature Burial (though the onscreen title drops the "The") features Ray Milland as artist Guy Carrell. When he accompanies Dr. Gault (Alan Napier) to an exhumation (or a grave robbing, depending on your perspective), he finds that the corpse was buried alive. As a result, he convinces himself that he is cataleptic and that he needs to prepare for the possibility of his own living entombment. The first half of the picture details his efforts in this regard, while the second half predictably details how they go badly awry. Hazel Court is here again as Guy's loving but terrified wife Emily. Due to contract restrictions, Price was unavailable, but Ray Milland (who the next year would do especially fine work for Corman with "X"-The Man With the X-Ray Eyes) turns in a finely detailed portrait of mono-maniacal obsession. Court is again suitable here, playing a completely different ingenue-type role equally well as the demoniac Juliana. The pairing of the two films is interesting on a purely visual basis. One can see in Burial some of the experimentation with color that would reach full bloom with Masque. Certain areas of the frame in the earlier picture are splashes of a single color, spread over a great many objects, with an effect not unlike an Impressionist painting. The camera is used well in both pictures, though to better effect in Masque, with its many tracking shots and deep movement into the sets. The result is a relentless feeling of pursuit that echoes the story perfectly. Image Transfer Review: Both films are presented in 2.35:1 anamorphic widescreen. They are from what appear to be practically pristine source prints, excepting only the expected dirt printed into optical effects and two unfortunate tears near the end of Masque. The first of these is a rather jagged, nasty affair that runs through 8 frames; the second is a much less obtrusive one that runs only 3 frames or so. I've looked forward to Masque on DVD ever since the format came out, and except for the tears, it is not a disappointment. The color is as expected, dazzling throughout, with rich, saturated color that is eye-popping. Detail is excellent, though the transfer is a shade on the dark side. There are good black levels and nice differentiation of texture. Audio Transfer Review: The 2.0 mono tracks are serviceable but no great shakes. Very minor hiss is detectable, though it's not bad for films of this vintage. The music has a rather tinny sound, and is somewhat clipped and distorted at times. However, the dialogue in Burial has some nice presence to it. Considering these are low budget Corman pictures, this is probably as good as they're likely to ever sound. Oddly enough, the audio is not changeable on the fly on Masque, though it is on the companion picture. Extras Review: A pair of interview segments with Roger Corman make up the primary extras here. That concerning Masque runs 18m:51s, but is devoted in large part to the Poe pictures in general and Corman's philosophies of filmmaking. He also displays a clear affection for European art films and discusses their influence on these drive-in staples. The Premature Burial featurette is shorter (9m:36s) but much more clearly focused on the movie itself. Both are worthwhile, but considering some of the excellent commentaries Corman has done, one wishes that he could have been persuaded to do full commentaries for these films. In any event, he's a highly articulate and thoughtful interviewee and he comes across quite well. Supplementing each side is a trailer for its film, presented in anamorphic widescreen. That for Burial is 2.35:1; Masque is 1.85:1. They look quite nice, though somewhat worn. Both tend to be gigantic spoilers for the films themselves, however, and should be avoided by those new to the films until afterwards. Apparently, due to the same mastering error as affects the audio, the subtitles on Masque are not changeable on the fly and must be changed via the main menu. 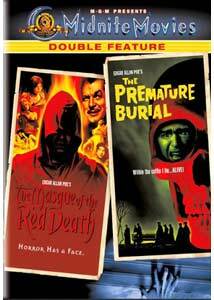 Two classic Corman Poe films for the price of one, with some useful interviews and beautiful transfers (though some unfortunate but brief source damage to Masque) make this a must for horror fans.